This issue of knit.wear has 24 thoughtful knitting patterns, knitting techniques for colorblocking, knitted cables on the bias, and more. knit.wear Fall/Winter 2013 is here! 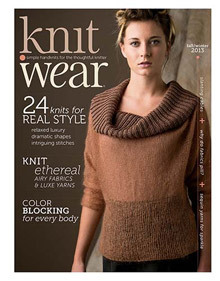 The Fall/Winter issue of knit.wear takes sumptuous to a new level with 24 thoughtful designs worked in luxury fibers. Simple yet thoughtful, these designs are both enjoyable to knit and easy to wear. Drape, silhouette, and texture combine in unique knits this season, from the dramatic to the smart, from the skewed to the simply pretty. Classic designs become head-turners. Plus, learn about setting cables on the bias, how to prevent pilling, and the art of colorblocking for your body type. Order your copy of knit.wear Fall/Winter 2013 today! 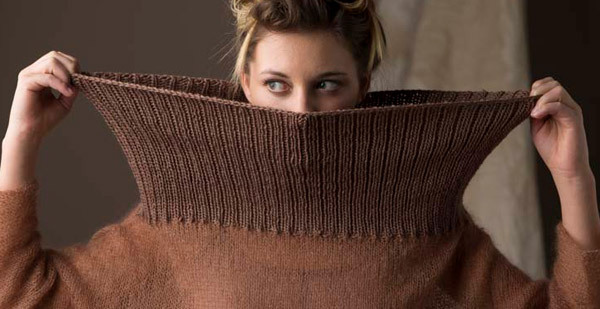 Natural Grace: These projects celebrate the natural elegance and beauty of knitwear. Angle Intrigue: These projects skew the normal to create intelligent angles and sharp corners. Cocoon: Knit dramatic cables for a classic twist in these comfy, cozy knits. Juxtapose: Jump into mixed media with varied stitches and colors in these unique knits. Midtown Original: Spice it up with these smart designs that scream originality. Take your knitwear to new heights, with gorgeous details and stylish comfort. Order knit.wear Fall/Winter 2013 today!